Born in Buffalo in 1935, George Breen was a champion rower for Bishop Timon HS and the West Side Rowing Club. He began swimming competitively as a freshman at Cortland State at the age of 17, almost a decade later than most of his rivals. Within four years he was setting World Records and winning Olympic medals. At Cortland State, Breen was mentored by legendary swim coach James “Doc” Counsilman, won his first National Championship in 1955, and was a three-time NCAA All-America. In 1956, George set World Records in the 1500 meters (18:05.9) in the NCAA’s at Yale, in the one mile freestyle (19:40) at the National AAU championships, and later that year in the 800 meters and 880 yard freestyle. Breen’s greatest performance came at the 1956 Olympics, where he lowered his 1500 meter World Record another 13 seconds, to a then incredible 17:52.9. Unfortunately, this was in the preliminaries and he could not repeat this time in the final, where he finished third. In those 1956 Melbourne Olympics, Breen also won bronze in the 400 meter freestyle and silver in the 800 meter freestyle relay. 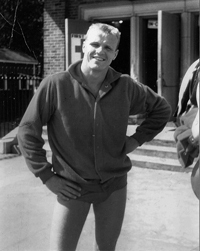 For the 1960 Olympics in Rome, Breen was elected team captain and won his fourth Olympic medal, a bronze in the 1500 meter freestyle. In his career he won 22 U.S. National Championships, four Olympics medals, and set six World Records. Most would agree that it was Breen’s, untraditional for the day, thrashing-rolling-shoulder-roll and two-beat kick that led to the evolution of today’s modern freestyle swimming. A long career as a swim coach and administrator followed. He coached Olympic medalists in 1964, ’68 and ’72, and from 1966-82 he coached the Men’s Swim Team at the University of Pennsylvania. George served on the U.S. Swimming National Board of Directors from 1977-96, on the U.S. Swimming Olympic Committee from 1972-96, and as President of the American Swim Coaches Association (1975-76). He was inducted into Cortland State’s first hall of fame class in 1969 and the International Swimming Hall of Fame in 1975, and, in 1997 received the prestigious U.S. Swimming National Award for exceptional service to the sport of swimming. The biographies contained on this website were written at the time of the honoree’s induction into the Hall of Fame. No attempt has been made to update these narratives to reflect more recent events, activities, or statistics.